From the time the British Forces left Malta in the early 1970s until today, successive governments have given us, the citizens of Malta, quite a few things that we now take very much for granted. We shouldn’t of course, but we do. We should thank them, but we don’t. We should be proud to have them but we aren’t. In fact we accept them as our right, even though we know, that it is very hard to provide them to each and every one of us. There are not many countries within the European Union where you can buy an expresso coffee in a good café for €1 to €1.50? It may be a small thing, but it gives you a pretty good idea that Malta is not a very expensive country to live in. In Switzerland, for example, an expresso costs the equivalent of at least €5. Now it is not easy to keep the cost of living down so that people can afford to live comfortably. In fact, it is usually a continuous battle, but all in all, we do live comfortably here in Malta. You can buy a stomach-filling meal at the many takeaways for just a few euros, or go to a not expensive bistro for a pasta or salad, depending on your appetite! If you want a good lunch or dinner in style, then there are plenty of excellent places to visit. We are spoilt for choice. How many countries give free education, both in primary and secondary schools? (Except private schools, but that’s a question of choice). How many countries give free university education? How many countries pay the students to go to school and university by giving stipends? Local students leave university with no debts hanging over their heads. People in other countries just don’t believe it when you tell them these things that are available in Malta and Gozo to educate our children. How many countries give free medical care in hospitals and polyclinics to everybody who wants it? Free medicines on a daily consumption basis? There are very few medicines that Maltese can’t get for free. How many countries wish they could do the same? People and governments in larger more prosperous countries have great problems with medical care and payments. In Malta we take it for granted. How many countries provide free school transport? How many countries give the same-day postal service? How many countries have free daily refuse collection? When the British services left Malta, they left behind them the basic infrastructure needed to run a country, but it has been successive governments over the years that have given so much to the Maltese people. And we all take it so much for granted. Now all these are very good, but one thing that one government after another has not been successful in doing is preserving our environment. An inexpensive cup of coffee yes, but a green environment accessible and acceptable to the public, no. To be fair, 60 years ago Malta had the same problem that we have today. Very few open spaces in and around our towns and villages. But over the years we have made it worse. 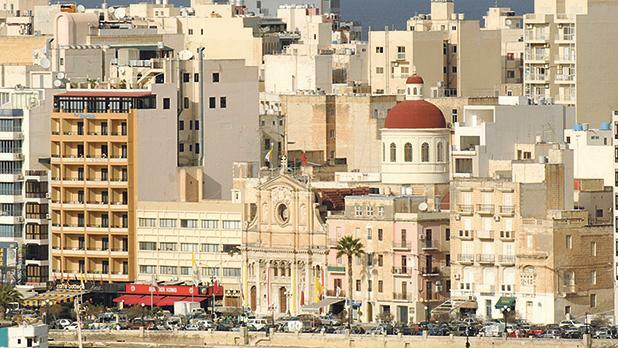 Sliema, for example, had a row of terraced houses on the seafront, and streets and streets of terraced houses stretching far behind with little or no public open spaces. What spaces there were, were jealously guarded and surrounded by high walls by their owners. When we decided to demolish the terraced houses, especially those on the seafront, we replaced them with terraced apartment blocks. Instead of making the developers build one block for every four terraced houses, thus having spaces between them, we carried on with the old idea and replaced terraced houses with terraced apartment blocks. Terraced houses throughout the Sliema area, are being replaced by terraced flats. If Sliema and Gżira didn’t have their promenades and promenade gardens then they would be even more claustrophobic places in which to live. The only open public garden purposely built within the St Julian’s area is the one in front of the Hilton Hotel. Stairs leading to the garden and lamps inside the garden were broken and vandalised many years ago and they are still not repaired. Having open gardens for the pleasure of the public are only good if they are clean and well kept. People using them cause wear and tear, and damage. These places must be maintained otherwise we are wasting our time. We must not think only about how well we are doing and how well we are living. Materialistic things are okay but they are not everything. Apart from doing well, we must also live well. This is why there should be a complete rethink about the future planning of Malta, especially the plans for the environment. What type and style of properties can be built and where. Where commercial premises can be built. What areas are kept only for residential housing. How to stop Malta from being a continuous building site. How to ensure all our services cope with essential development. How to make sure housing is affordable and accessible to everyone. Having things free is nice, and I thank successive governments for giving us such luxuries. But I wish that a select committee could be formed where a long-term master plan is created and made law and stuck to, and enforced. That would make Malta and Gozo a place that is physically and environmentally worth living in as well as financially comfortable. This is not impossible. A master plan can be made but it must be stuck to at all times and obeyed religiously. So many rules and laws have been made in the past but ignored. For example, there should be a well to collect rainwater in every house and block of apartments. How many blocks of apartments have wells? It is not impossible to stick to a master plan if one is made comprehensively, reasonably and effectively. This plan must be made absolute law, because if we carry on as we are with everyone doing what they want, this little island of ours will be very much less attractive to live in.